What a beautiful Halloween day! I can't remember when we have had such wonderful weather. I'm so glad! all I'm going to say is it just takes a little faith, trust..... and *pixie* dust! Boy am I letting y'all down on my shoe tales or what!? I promise I'll try to do better! 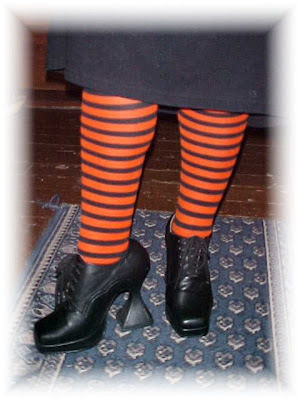 Here is a pair of WITCHY shoes! I love the heels on these. I bought these about 4 years ago. So much fun to wear on Halloween! They are Demonia brand, and you can still find them~ there are different colors and styles as well. The heels are called coffin heels, bwah-ha-haaaa! I don't wear these often, but they sure come in handy when I need REALLY tall shoes! 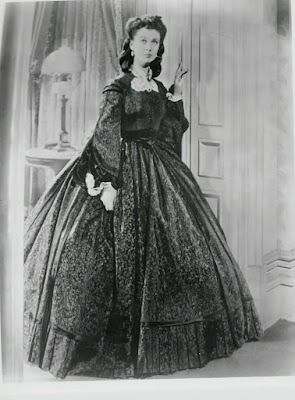 My GWTW Portrait gown is too long for me, and I wore them all day with this gown twice. This was taken at A Walk Back in Time two years ago. It's an event that has Civil War, Revolutionary War, WWII and Old West reenactments. 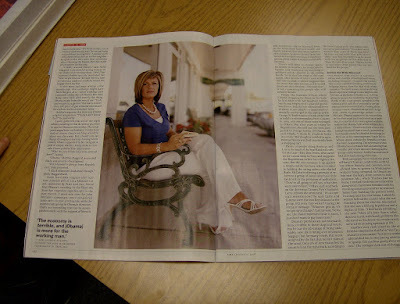 I told y'all I had been very busy on the net with something taking time away from my blogging~ I've been researching! 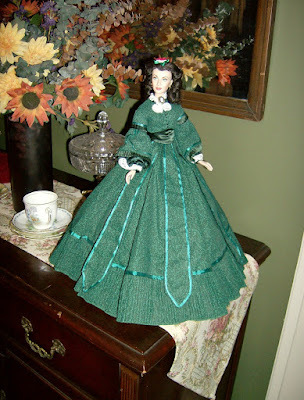 I've asked my seamstress Christine to create Scarlett's green Christmas gown for me. So I've been burning my eyes out searching for materials and details for this gown. Also Nova and I have been sick... as well as Melly cat! Plus I've been working on Halloween costumes. 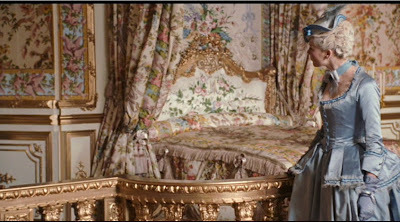 We barely see a glimpse of this wonderful dress in Gone With the Wind. Scarlett wears it when meeting Ashley at the depot for Christmas, though it is hiding underneath her mantle (coat). 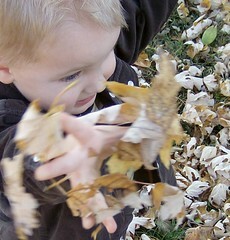 As always, photos should enlarge when you click on them. Next we see her for a few seconds after "eating the last chicken in Atlanta", and then one last look as she watches Melanie and Ashley go upstairs. This gown is one of the few she has that is more period correct and not so"Hollywood". That is one reason I want it made, so that I can wear it to Civil War Reenactments and such. Isn't that collar spectacular?? I hope I can come close to re-creating it! 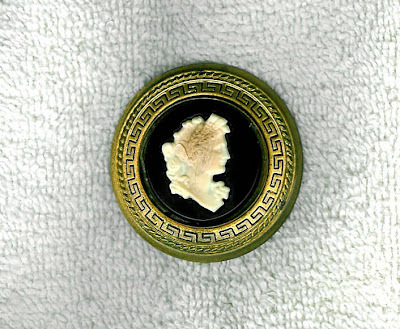 I have two of the replica brooches. They were offered as a premium from Lux soap in 1940 available for 15¢ and 3 soap wrappers. 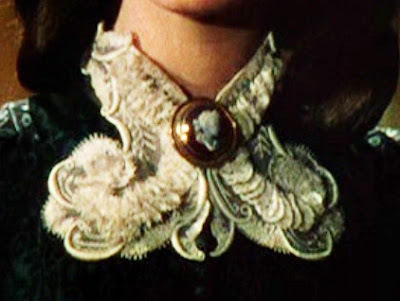 It was known as "Scarlett's Cameo Brooch." These are rare but can still be found on ebay and such. They usually range from $50-100. There is one on Ruby Lane for $121. 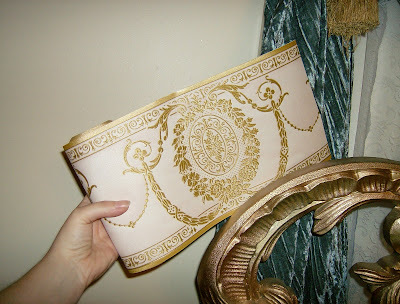 You might find one in your mother or grandmother's jewelry box! 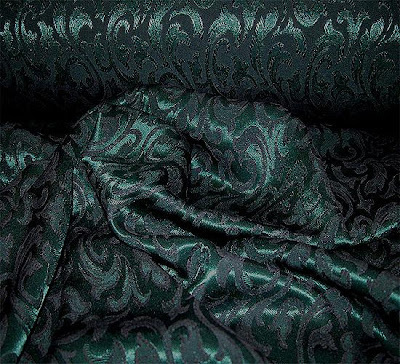 I found a suitable fabric last year. What a bargain! 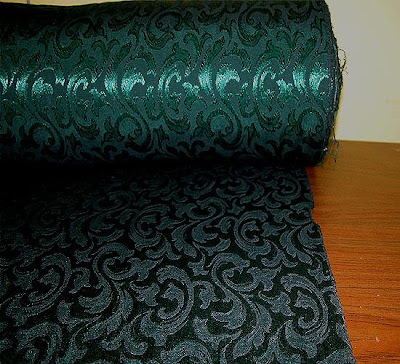 A jacquard that should've cost about $20 a yard was less than $5 a yard, woohoo! I had not actually planned to do this gown for myself, as I was trying to be good and say enough is enough! I was helping my dear partner in crime, Dee, as she had been searching a long time for fabric. Needless to say, when I saw the fabric and showed Dee, she twisted my arm! Dee is tall and needs quite a bit of yardage. If I remember correctly, she ordered 30 yards! 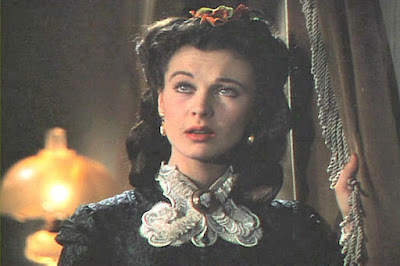 GWTW4ever is her seamstress. 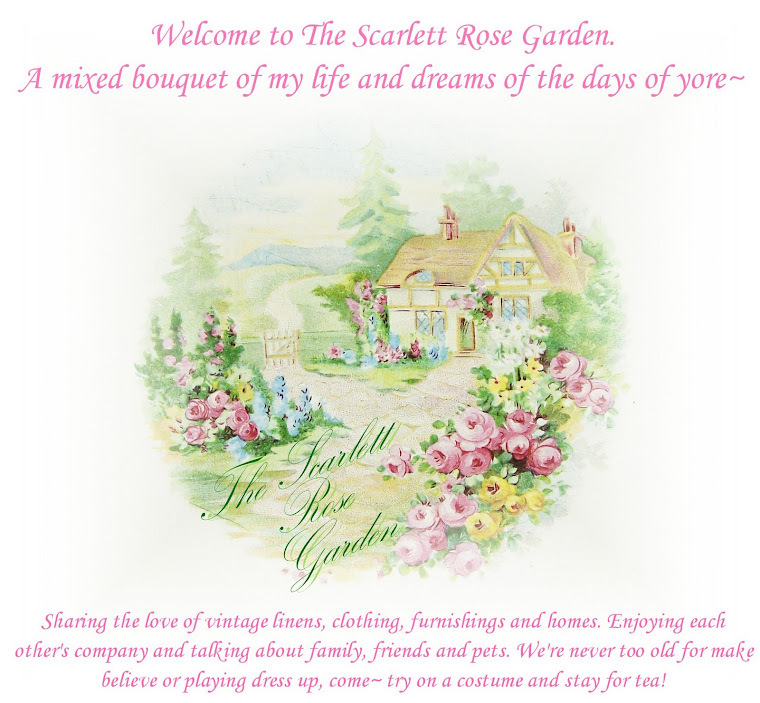 You can check her link to see this gown made in a gorgeous velvet. Dee's gown is not pictured yet and I'm anxious to see our two gowns made! 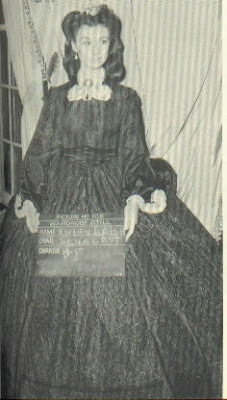 GWTW4ever also sells gwtw doll costume patterns. 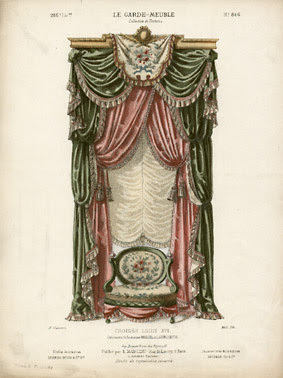 Such details on this gown! Wonderful pleating, bias cut trim, streamers hanging from the waist, silk undersleeves with lace that matches the neckline, and buttons down the front. 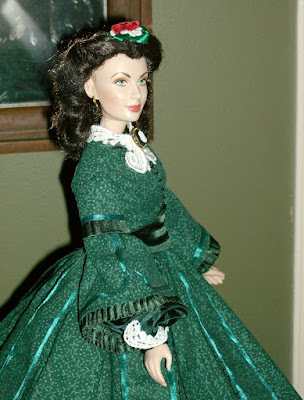 Here is my Franklin Mint vinyl Scarlett doll wearing this fabulous gown. I picked out the fabric and sent it off to Alana to be made. I just finished making her a new collar and cuffs and I'm quite proud of how they turned out! I also made her hair ornament. 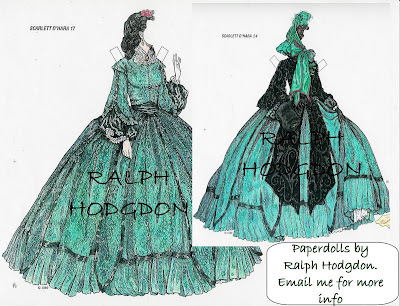 These are paperdolls done by Ralph Hodgdon. 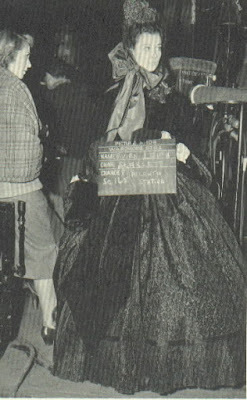 He was friends with the late Walter Plunkett who designed the costumes for GWTW. 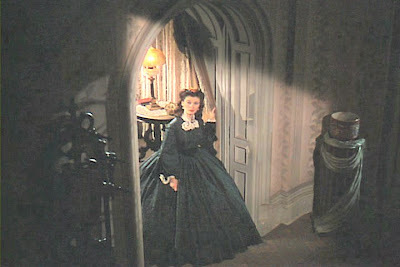 Ralph's gwtw collection is just amazing. 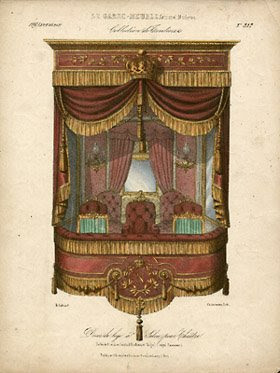 Such detail! They have been a great reference when researching these frocks. If anyone is interested in his work, please email me. He is not online. Fiddlee dee-dee, stay tuned everyone~ I hope to have this gown for Christmas! Help! 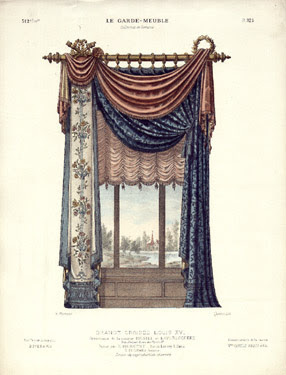 I have a vintage tablecloth I want to use in the bathroom as a window treatment. I was going to hang it with ribbons, and swag it over. But I tried it and didn't like it. It just doesn't swag well with the pattern on the fabric. It would look cute like this *if* I didn't want any light coming through the window. I'm thinking of cutting it down the center to make two panels. Then hanging them so the blue borders would be facing each other in the middle. 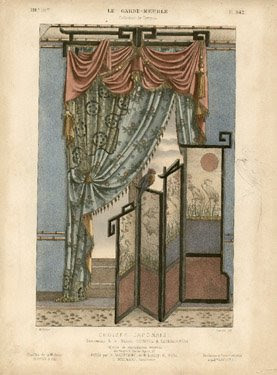 Here is a virtual of how it would look cut into two panels and hung as stated. I would then swag one or both panels back... or push them back on the rods further, as I'll be making a pocket to sheer them on. So, what do you think? Should I do it, or leave this vintage beauty as is? Good news folks! 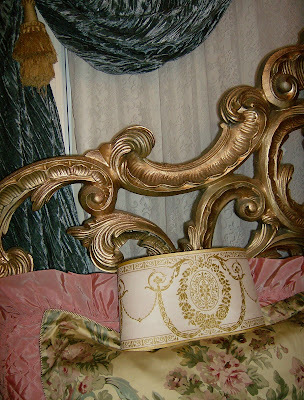 After writing my post about the Shauna Velvet drapes from Bed, Bath and Beyond I went to their site once again. I typed in the UPC code and still nothing. I've searched google and ebay many times; nadda. So this time I emailed BB&B. They wrote back saying that I could order them, there were still some available at other stores! Woohoo! Not only that my friends, but they are now clearanced down to $9.99. Original price was $29.99. I had three coupons and they let me use them all! I'm so excited! In other boudoir news, a bedding set that I have been drooling over at Kohl's since it came out has finally gone on clearance for 60% off! Same thing there, I searched the net and ebay forever and never found it cheaper. It is just starting to trickle into ebay, I suppose from being clearanced at the stores and people are gobbling them up. 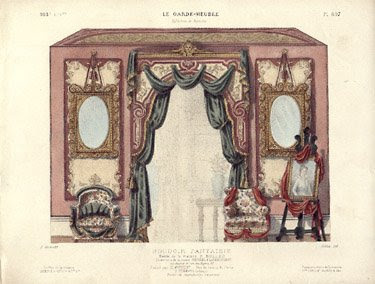 The set is called Welbourne from Chaps; Ralph Lauren. Kohl's was listed on the cleaning tag, so no wonder I couldn't find it anywhere else! 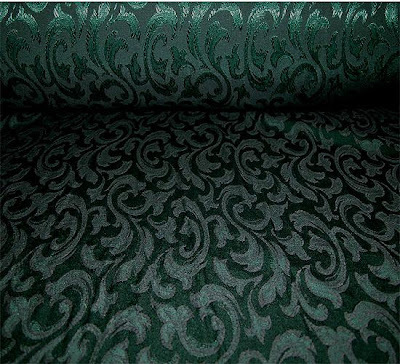 Here's the advertising pic, and a closeup of the fabric. It's 100% cotton sateen. Lucious. 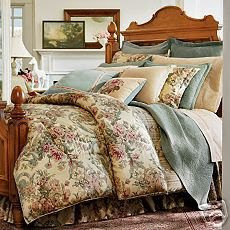 I wish the bedskirt was the same ticking looking stripe as the reverse of the comfortor and shams. Oh well, a girl can't have everything! So now you'll see I'm toning it down a notch, we can't have Kevin living in the "land of precious" as he calls it. At least not *that* precious! 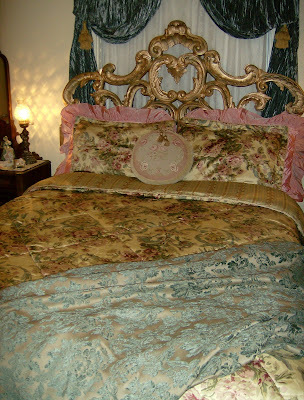 Besides, I can't leave that vintage set on the bed, the cats would tear it up. It's for *display purposes only* SNORT! 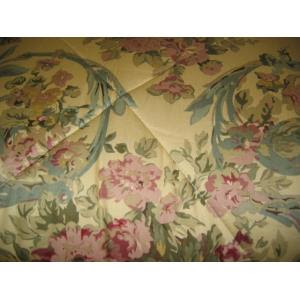 The fabric draped across the bed is some yardage I had bought to redo a chair. I really need some new FLUFFY pillows for my shams. These look sad and saggy. 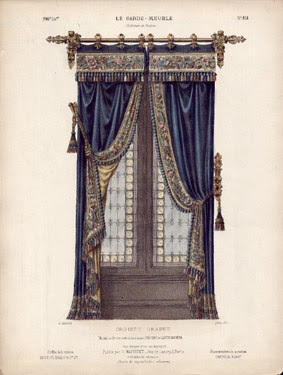 Now, with more drapery panels en route, I'll show you some of my inspiration photos. So rich looking! Most of these photos are from The George Glazer Gallory. Stunning lithos you can purchase; if you are well off. 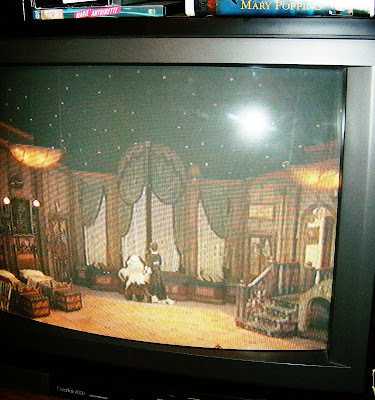 I also like the windows on Peter Pan with Cathy Rigby. Crummy pic, sorry...best I could do! 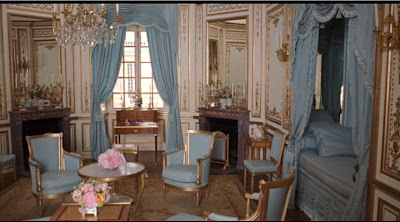 I like the whole bedroom setting. 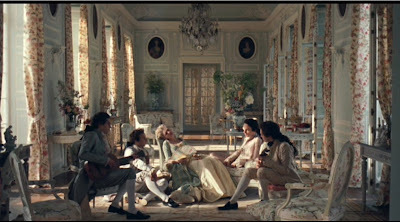 Then naturally there's our beloved Marie Antoinette's Versailles~ Le Drool. 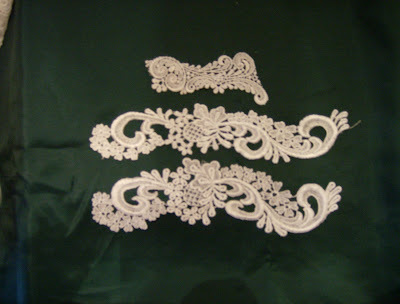 This is a border I plan to put up, with gold molding. Over the top? 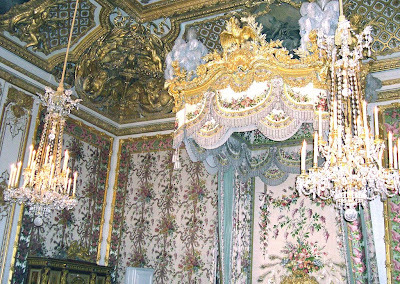 Gaudy? Yes. Me likey! 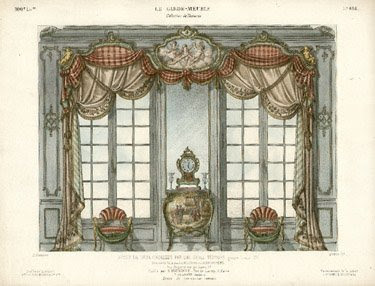 A boudoir is a lady's private bedroom, sitting room or dressing room. 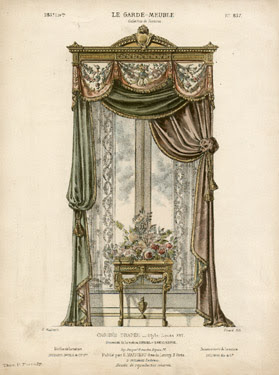 The term derives from the French verb bouder, meaning "to pout". 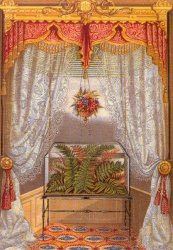 In Caribbean English a boudoir is the front room of the house where women entertain family and friends. 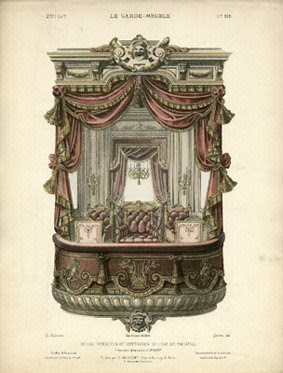 Latterly, the term boudoir has come to denote a style of furnishing the bedroom that is traditionally described as ornate or busy. 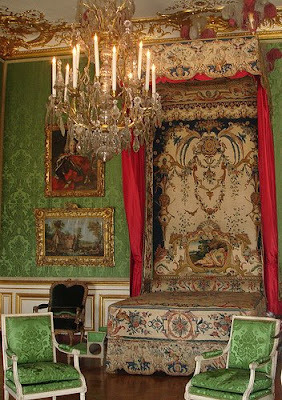 The plethora of links available on the internet to furnishing sites using the term boudoir tend to focus on Renaissance and French inspired bedroom styles. They have, in recent times also been used to describe the 'country cottage' style with whitewashed styled walls large heavy bed furniture and deep bedding. Just a note to let y'all know that I edited Kim's post with links to her article, ect... it was late last night and I didn't even think about that, duh! 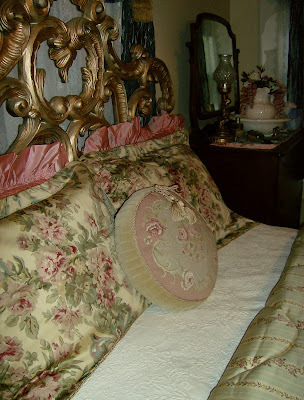 Also, thank you so much for all the nice comments on my bedding and boudoir posts. I really appreciate it!